Minnedosa's Curt Ridley played 78 games in two years with the Portage Terriers of the Manitoba Junior Hockey League, putting up five shutouts in that time frame and a 3.59 Goals Against Average . Called up to the Brandon Wheat Kings for five games during the 1970-71 season, his performance caught the eye of the Boston Bruins who selected Ridley in the second round of the 1971 NHL Amateur Draft. Ridley became the first player to ever be drafted directly from Tier II Junior A. After 3 seasons in the Bruins system, the New York Rangers claimed Ridley in a Reverse Draft and he got his first taste of NHL action. Traded to the Atlanta Flames he was assigned to the Tulsa Oilers where he picked up the CHL'S Terry Sawchuk Award for fewest goals-against. In January, 1976 the Vancouver Canucks traded their First round draft pick to obtain his services. With the Canucks he would see regular NHL duty for the next three seasons. Sent down to the Dallas Black Hawks of the Central League for the 1978-79 season, Ridley would help the Hawks win the Adams Cup championship and take home the Max McNab Trophy for Playoff MVP. 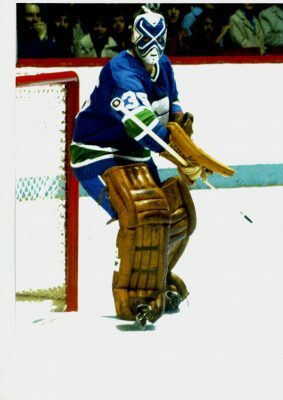 In 1980 the Toronto Maple Leafs purchased Ridley where he would remain until finishing his career with the Cincinnati Tigers of the CHL. He played 104 games in the National Hockey League with the New York Rangers, Toronto Maple Leafs, and Vancouver Canucks.